Tiny collectables have arrived at toy stores. 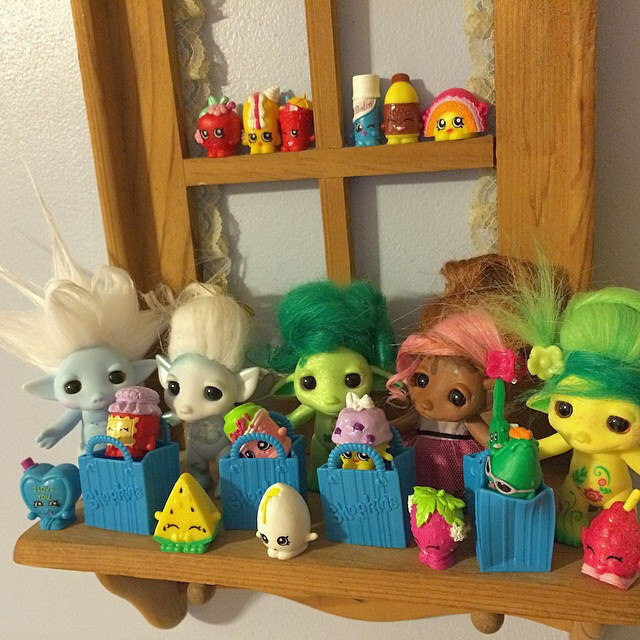 The tiny collectables go by many different names including Shopkins, Num Noms, and Tsum Tsum. Although they have only just arrived in toy stores, sales of products like these accounted for US$142M in sales last year. It turns out that this is actually a very small slice of the $25B U.S. toy industry. However, it is these toys that are causing people to seek out and come into toy stores. The tiny collectable products generally have low price points. Often between $2 – $5. This allows shoppers to treat them as collectables. Retailers are seeing shoppers return to their stores over and over again to get more of the tiny collectables. The reason that they are returning is that they want to purchase the tiny collectables that they need in order to complete a series. Toy stores make roughly half of their money in the months around Christmas. The reason that tiny collectables are so important is that they are bringing in customers throughout the year. When a customer buys tiny collectables, they are generally buying what are called “blind packs”. This means that the customer does not know what tiny collectable characters are inside. One of the things that makes blind packets attractive to retailers is that unlike pricier toys they generally don’t have to discount them and so this can keep their profits steady. As the popularity of tiny collectables has grown, toy store product managers have started to devote more shelf space to these types of products. As their popularity has increased, more brands of tiny collectables have been launched. Blind packs are now available that feature characters that are based on children’s movies and well-established toys such as Legos. The people who study toy markets believe that there is still room for the tiny collectable market to grow. They believe that some of today’s well established tiny collectable brands, such as Shopkins, may end up losing market share in the future as the shelves become more crowded with more varieties of tiny collectables. When customers are presented with more choices, it’s only going to be natural for sales to become more fragmented among multiple brands. The tiny collectable market was originally created by the Australian toy maker Moose Enterprise. They are the company who created the Shopkins line of tiny collectables which put them on the map starting in 2014. The figures that they created were simple and based on items that could be found in a grocery store such as ketchup and butter. The company has expanded into larger dolls, playsets, and has established licenses for apparel and accessories. This has allowed the company to record over $1B in sales. Product managers for toy stores have always had a problem. They have no problems getting people to come shop at their stores at Christmas time; however, they’d like them to drop by during the rest of the year also. Their prayers may have been answered by the arrival of a new type of product. Tiny collectables don’t cost a lot, but because people are collecting them they will be willing to drop by the toy store multiple times in order to collect new items. Although tiny collectables only represent a small part of the very large U.S. toy market, they are they toys that are causing people to visit toy stores over and over again. Tiny collectables don’t cost a lot and this allows people to start collections. When people buy tiny collectables they buy them in “blind packs” and so they really don’t know exactly what they are buying. The popularity of tiny collectables has meant that they are now getting more and more shelf space dedicated to them. This market will grow, but the established players will probably lose market share. One of the most popular lines, Shopkins, was created by the Australian company Moose Enterprise. They have expanded their product lines and are now making a lot of money. In the toy world, product managers always have to be careful about fads. Toys can be hot one minute, and the sitting on the shelf the next. Tiny collectables appear to have a great deal of life in them because of the customer demand and the fact that there are so many different varieties of them. Product managers need to use the popularity of these toys to get customers to come into their toy stores more often and to buy more toys when they do come. The opportunity has been presented to them, now toy store product managers just need to make the most of it. Question For You: Do you think that a toy store could ever have too many different types of tiny collectables? .At some point in time we all have the need to get some furniture. When this happens to you, what do you do? Where do you go to get furniture? If you are like a lot of us there is probably some local store that runs a million ads on TV or in the newspaper that is the place that we all start our search at. However, what if you could start your search someplace where you already buy a lot of things? What if you could go to Amazon and buy that chair, table, or dresser that you’ve decided that you need?